This chapter provides the implementer’s perspective on the Chhattisgarh Swasth Panchayat Yojana as an example of convergence on a single, decentralized action platform for health and its determinants. The rationale for this initiative was the wide-ranging participation of community institutions like the Panchayat (an elected Village Council) in coordination with the Village Health, Sanitation, and Nutrition Committees (VHSNC), and Mitanins (Community Health Workers or CHW), stewarded by the State Health Resource Centre of Chhattisgarh in collaboration with the state Government. From 2006 onwards, there has been active community engagement in the collection of data on indicators of health status, access to health services, and determinants of health (nutrition, water, gender, employment). Indicators have been designed so that the community can record, understand and make use of the data to advocate for and monitor improvements in public service delivery. The challenges and lessons are many, including the fact that poor progress on indicators can sometimes reflect the severity of social determinants and not merely the lack of progress or success of any action. The process has seen several iterations and revisions, and the addition of new components to compile and use the data at levels beyond the village. This chapter attempts to describe how multiple interventions were brought in at various stages. The impact is a result of the mutually-reinforcing, interlinked and therefore integrated set of interventions, with some interventions being seen as more successful than others. The community platform was strengthened at each stage, where further components were added based on a periodic analysis of what worked and what did not. The process of analysis and the adding of components was also guided by a vision of community empowerment and a holistic definition of health that specifically included SDH. The complex and interlinked nature of interventions were crucial to achieving convergent action on health and Social Determinant of Health (SDH) and its scaling-up. Chhattisgarh has scaled-up the Swasth Panchayat program across the state and has institutionalized its implementation and facilitation arrangements. The National Health Mission has included the essential components in its guidelines. The adequacy of arrangements for the facilitation of community-level structures and the autonomy of key actors will be crucial to the success of its replication. State Health Resource Centre (SHRC). Mitanin programme: conceptual issues and operational guidelines. Raipur: State Health Resource Centre; 2003. http://www.shsrc.org/pdf/MitaninProgramme/ConceptualIssuesandOperationalGuidelin.pdf. Accessed 10 Mar 2015. European Union State Partnership Programme (EUSPP). Draft report on evaluation of the community health volunteer (Mitanin) programme. Raipur: Department of Health, Chhattisgarh; 2011. http://health.cg.gov.in/ehealth/MitaninFinalReport11thMarch2011.pdf. Accessed 4 Jan 2012. 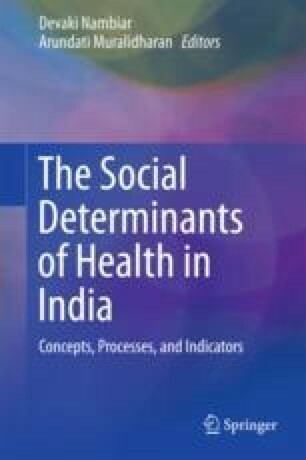 Nandi S, Schneider H. Addressing the social determinants of health: a case study from the Mitanin (community health worker) programme in India. Health Policy Plann. 2014;29:ii71–81. doi: 10.1093/heapol/czu074. State Health Resource Centre (SHRC). Village health sanitation and nutrition committees in Chhattisgarh, An assessment; 2012. www.shsrc.org. Accessed on 15 Feb 2015. State Health Resource Centre (SHRC). Campaign to increase Participation (Sahbhagita Badhao Abhiyan); 2015. www.shsrc.org. Accessed on 14 Apr 2015. State Health Resource Centre (SHRC). Community based monitoring of health in Chhattisgarh, Report 2013; 2013. www.shsrc.org. Accessed on 15 Feb 2015. Garg et al. Documentation of deaths by local communities to counter severe under-reporting of deaths by government: experiences from a community based monitoring process from India. Poster presentation at the Third Global Symposium on Health Systems Research: The Science and Practice of People-Centred Health Systems 30 Sept to 3 Oct 2014, Cape Town, South Africa. 2014. Abstract available: http://hsr2014.healthsystemsresearch.org/sites/default/files/Poster-Presentations.pdf. Accessed on 15 Feb 2015. State Health Resource Centre (SHRC). Public Dialogue events Report 2013–14. (Swasth Panchayat Sammelan—Jan Samwad). 2014. www.shsrc.org. Accessed on 14 Apr 2015. 2013–14 Maharashtra. http://nrhm.gov.in/nrhm-in-state/state/programme/implementation/plans/Maharashtra/html. Accessed on 15 Feb 2015. National Rural Health Mission. 6th common review mission report; 2012. http://nrhm.gov.in/images/pdf/monitoring/crm/6th-crm/6th_CRM_Main_Report/pdf. Accessed on 15 Feb 2015.